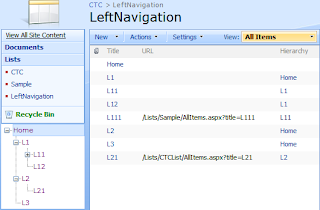 It’s a very common requirement in SharePoint to implement a multilevel Left or Top navigation. And another requirement is that it should be configurable i.e. user able to add or remove the navigation links. 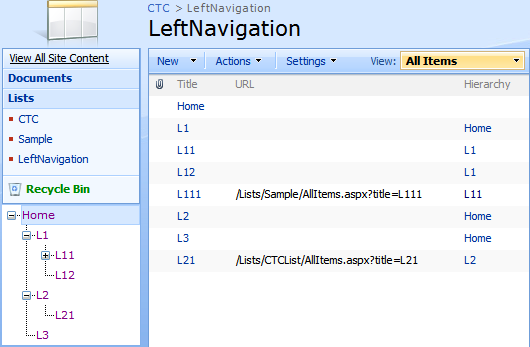 I have used treeview control and SharePoint list to implement Left navigation of the site. Add new Class Library project or WSPBuilder project. 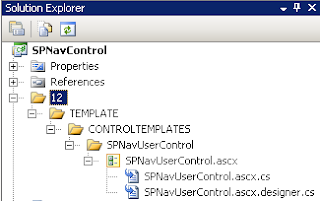 Then add a User control inside the CNTROLTEMPLATES folder (as shown below). <%@ Control Language="C#" AutoEventWireup="true" CodeBehind="SPNavUserControl.ascx.cs"
<asp:TreeView BackColor="White" ID="treeViewLeftNav" runat="server" DataSourceID="xmlDS"
Step 4: Write following code in code-behind file (.cs) to generate XML string (data source) from the SharePoint List and bind the Data source to the treeview control. // Handle and Log your exception here. 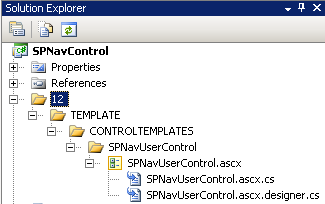 Step 5: Add this User Control in master page. Note: There is limitation of the treeview control. It will not maintain a state after redirection. To overcome this limitation, I have introduced ‘Hierarchy’ column which always point’s to parent node. When user clicks on any of the links from navigation it is redirected to the URL specified in NavigationUrl property of Treeview. As the user control is placed in master page, in treeView_PreRender event with the help of the current URL I am finding the level of the clicked node and expanding it based on that. I have used the code given above. There are two issues that i am facing. 1. The tree is not generated when i name the Look up column "Hierarchy" and i get an error message Column "Hierarchy" not found. When i use "test" as look up column name the tree is generated. 2. The tree does not maintain its state after page reload. Please suggest what i am doing wrong. Please provide the screenshot of the 'LeftNavigation' list.